You don't need access to expensive equipment or a gym membership to lose weight and become physically fit. Do calisthenics several days a week and you'll reap the benefits of increased strength and improved cardiovascular performance. Develop strong muscles, a toned body, strong lungs and a healthy heart with calisthenics. Calisthenics are exercises that don't require external resistance or weight. Exercise against gravity and your body weight will create the challenge. The military, physical education programs in schools and law enforcement programs often incorporate calisthenics into their training programs. You can exercise your major muscle groups with various calisthenics. Squats, pushups, lunges and dips are basic calisthenics, as are jumping jacks, situps, pullups and crunches. 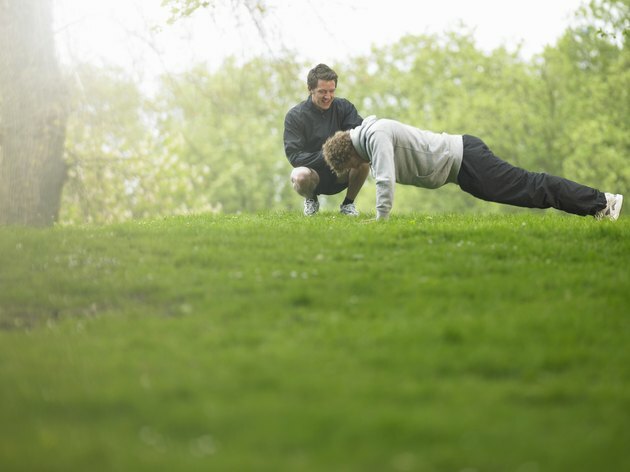 More advanced calisthenics include jumping lunges, single-legged squats and power pushups. Pay attention to your form while you are doing calisthenics -- it is far more important to maintain correct form and posture throughout the exercises than to complete a certain amount of repetitions or sets. Keep a soft bend in your elbows and knees throughout the exercises; locking either of those joints can lead to injury. Use calisthenics for strength training and you will save money, avoid gym membership costs and won't have to purchase equipment for your workout routine. Perform a circuit of calisthenic exercises and your heart rate will increase during the routine, burning additional calories and contributing to weight loss. Body weight resistance eliminates the possibility of cheating, or using other muscles to help, that arises when using machines for strength training. Calisthenics increase flexibility, build endurance and contribute to toned and strong muscles. The American College of Sports Medicine recommends at least two days of strength training a week to meet health and weight goals. Do a third weekly session to increase your strength and accelerate weight loss. Rest a day between sessions and allow your muscles to recover and build their strength. Overtraining leads to early fatigue and contributes to higher exercise drop-out rates. Run, jog or do another form of cardio on the days you are not doing calisthenics. You will lose more weight and burn calories. Calisthenics that require jumping can place stress on the hips, knees and ankle joints. If you have a history of back pain or problems, avoid any exercises that requires you to bend or twist at the spine. Progress slowly. Start with beginner exercises and build enough resistance and strength before performing advanced routines. Combine a healthful diet with exercise for significant weight loss. Do not rely solely on exercise to meet your weight loss goals. How Many Calories Are Burned During 30 Minutes of Weight Lifting?